I built this guitar for a woodshow circa 2002. The body is based on a Martin 000 size & shape and is built of solid mahogany. 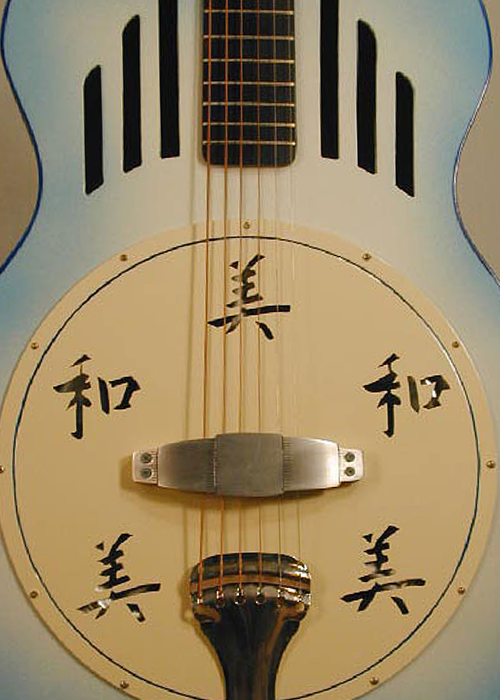 I used a spider style resonator apparatus and the aluminum cover-plate has the Chinese characters beauty and harmony pierced thru it. The neck is twelve frets to the body and is topped with a slotted Maccaferri style peg-head. And as I often enjoy doing, all of my design elements follow the deco school. I love the way this guitar came out and even though I don’t really know how to play the thing it is not for sale. The final photo in this grouping takes a peek at the design process of this instrument. I created a series of full size elements out of paper for this project which were then taped to the wall. There were separate pieces for the body and the neck and the peg-head and the coverplate – everything - and the pieces kept getting changed and adjusted and re-colored and joggled around until the composition was “just right”. This photo documents the design process as it was “nearly right”.